How much storage capacity does the NFWB have? The NFWB has two million gallons of elevated water storage; in the event of a pumping failure, this water could service the entire City of Niagara Falls for up to two hours. 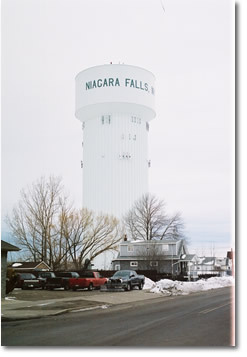 Water constantly circulates through a water tower keeping it fresh; in the event of a pumping emergency the tower can provide water to the City of Niagara Falls at little or no loss in pressure. Wastewater treatment is the process of removing solids and dissolved contaminants from the water sent to the wastewater plant for treatment. At the NFWB’s Wastewater Treatment Plant, this process starts at the bar screens, which remove large solids. The next step is grit removal, which takes out smaller particles that settle readily. Once the grit is removed, the wastewater is treated with ferric chloride and polymer to flocculate/coagulate to allow solids to settle out in the sedimentation basins. These solids are sent to the thickeners and then onto the belt presses for dewatering and disposal. After the vast majority of solids are removed, the wastewater then flows through the carbon beds to remove dissolved contaminants and to filter out any remaining solids. The purified wastewater leaves the carbon beds. It is treated with peroxide for odor control and sodium hypochlorite for disinfection before returning to the Niagara River. What new technology is being utilized? Carbon treatment of wastewater, while not a new technology, is not widely used throughout the United States. 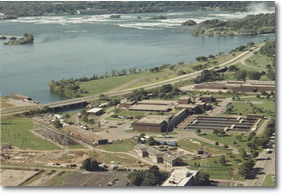 Carbon treatment was selected in the 1970s for Niagara Falls due to the large amount of wastewater coming from the chemical plants. Carbon can treat badly contaminated wastewater that would normally cause problems for biological processes. I smell sewer gas. What should I do? Contact your Fire Department immediately to determine what type of gas you smell. Sewer backups are caused by a lateral blockage (homeowner’s sewer) or a problem with the Niagara Falls Water Board’s sewer main. What should I do when a back up occurs? Contact a plumber or the Niagara Falls Water Board at 716.283.9770 to check the lines and determine who is responsible. My water seems to be running slowly. What is the cause? There may be a leak, water main break, or other maintenance activity that causes water to run slowly. If the problem continues call the Niagara Falls Water Board at 716.283.9770. You can put a couple of drops of food coloring into the toilet tank, then wait about an hour. If the color shows up in your toilet bowl you have a leak. You can also call the Niagara Falls Water Board at 716.283.9770 for more information. Most homes have a shutoff valve in the basement just before the water meter. There is also a shutoff valve underground in the front of the property, between the curb and sidewalk. My water looks "dirty". How can I get it to clear up? Run the COLD water for a few minutes. If it does not clear, call the Niagara Falls Water Board at 716.283.9770. Why is my water "brown" colored? This may be due to a water main break or hydrant use. Please call the Niagara Falls Water Board at 716.283.9770 and we will send someone out to check on the problem. Why is my water "milky or white" colored? How can I get a copy of the Water Quality Report? A copy of your Water Quality Report is available on line at our Water Quality Reports page. Yes. As a service to our customers, water is fluoridated to NYS Health Department standards. Where does NFWB's water come from? The water comes from the upper Niagara River, just downstream of the Grand Island Bridge. 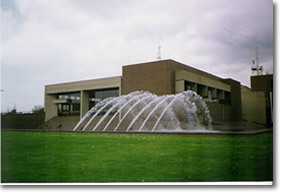 The NFWB services all of the city of Niagara Falls and a small part of the outlying towns. I'm installing an in-ground swimming pool, a fence, or a sprinkler system in my yard. Do I need to notify Water Board? If you are installing a lawn sprinkler system, you need to contact the Water Board at 716.283.9770 to ensure that you are in compliance with New York State and County Health Department regulations. If my water is off due to a main repair, how long will it be off? This depends on the severity of the repair, but usually several hours. Why wasn't I notified in advance of the water being shut off? If the maintenance is scheduled, we will make every effort to notify all affected residents. If the maintenance is due to an emergency, we will try our best to notify those affected, but minimizing the emergency is our first priority. Why are colored stakes, flags, or paint marks on my lawn or sidewalk? These marks are used to identify the location of buried utilities. 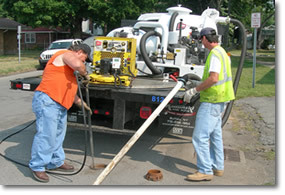 Before any excavation, New York State Law requires having all underground utilities marked. Blue lines show where water lines are buried and green lines denote where sewer lines are buried. Also, yellow lines show natural gas lines and red lines show where electric lines are buried. Grading and seeding is usually done seasonally, in the spring and summer after the ground has had a chance to settle. Permanent patching with asphalt is done typically within three weeks of the repair. During the winter permanent repairs are delayed until weather permits. No. Only the fire department, NFWB employees, or those with a permit may operate the fire hydrants. Unauthorized use of a fire hydrant is illegal and violators will be prosecuted. What should I do for a seasonal residence that is not heated during the winter? Call the NFWB at 716.283.9770 to schedule a shutoff. What should I do if I believe my service could freeze? You can read our Frozen Service Policy to see what options are available to you. Also, customers can apply to be on the NFWB Drip Program. What is the process for getting approval for a discharge? A written description of the anticipated wastewater discharge should be sent to the Industrial Monitoring Coordinator which includes a detailed explanation of and the nature of the source of wastewater, duration, maximum daily flow, and any pollutant analysis data for the previous three years. The request should be sent to Joel Paradise at the Niagara Falls Water Board. If you have questions, please contact him at [email protected] or 716.283.9770, ext. 261. Are there electronic versions of the permit application? Yes! Please see the Compliance and Inspections page of this website. What are the acceptable levels of pollutant discharge (local limits)? The acceptable levels are dependent on each particular pollutant. Please contact Joel Paradise at [email protected] or 716.283.9770, ext. 261. Do you accept Trucked wastewater? Trucked wastewater is reviewed and accepted on a case-by-case basis. The Niagara Falls Water Board is seeking long-term frequently delivered waste streams that do not upset our treatment process. A written description of the anticipated wastewater to be transported should be sent to the Industrial Monitoring Coordinator, which includes a detailed explanation of and the nature of the source of wastewater, duration, maximum daily flow, and any pollutant analysis data for the previous three years. The request should be sent to Joel Paradise at the Niagara Falls Water Board. If you have questions, please contact him at [email protected] or 716.283.9770, ext. 261. A sanitary sewer is a pipe located in the NFWB right-of-way that is designed solely to transport wastewater from sanitary fixtures (toilets, sinks, laundry etc.) in your house or place of business to the NFWB’s Wastewater Treatment Plant. Sanitary sewers in your neighborhood are owned by the NFWB. What is a storm sewer? A storm sewer is a pipe located in the NFWB Right-of-Way that is designed to carry storm related water runoff. Storm sewers are normally much larger than sanitary sewers because they are designed to carry much larger amounts of flow. Storm sewers are owned, operated and maintained by the NFWB. 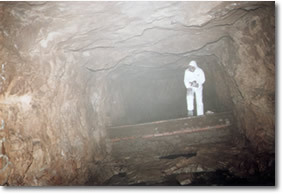 What is an illegal sewer connection? An illegal sewer connection is a connection that permits extraneous storm related water (water from sources other than sanitary fixtures) to enter the sanitary sewer system. The extraneous storm related water is water that should be going to the storm sewer or allowed to soak into the ground without entering the sanitary sewer. What are the different types of illegal sewer connections? Illegal sewer connections include connections of roof downspouts, sump pumps, footing/foundation drains and basement drains to the house sanitary sewer lines. In addition, defective house sanitary sewer lines cause extraneous water to enter the sanitary sewers and thus they are also illegal connections. Where should storm drainage from downspouts, sump pump and/or other drain appurtenance be directed if it cannot be discharged to the sanitary sewer? Modern subdivision construction standards generally call for water from sump pump, area drains and the like to be diverted to the storm sewers, front or back yards or above ground drainage ditches. Why is it important for everyone to remove illegal connections? Removal of illegal connections will significantly reduce the flow of extraneous storm related water in the sanitary sewer system. This storm water ends up at the wastewater treatment plant and is treated along with sanitary flow. If the Village and its residents can reduce the amount of storm water in the treatment plant, the costs of operating the plant can be significantly reduced. How can illegal sewer connections cause basement flooding? A surcharged sewer flows at a level greater than the “normal” level. If the home has sanitary fixtures or floor drains at an elevation below the surcharge level, basement flooding can occur. The sanitary sewers have been designed to transfer sanitary waste only. Extraneous storm water flow added to the normal sanitary flow can exceed the capacity of the sanitary sewer resulting in a situation where the sanitary sewer is “surcharged”. Basically, surcharging occurs when the amount of flow trying to get through a pipe exceeds the maximum capacity of the pipe thus building up pressure in the pipe. When pressure builds up it seeks to relieve itself through any means possible, one of which is by backing up private sanitary services and filling basements and crawlspaces. Reducing the extraneous flow will reduce the surcharging and sewer back-ups. Do illegal connections really contribute large amounts of extraneous water to the sanitary sewer system? Yes. For example, a typical eight-inch sanitary sewer can handle domestic sewage from up to 225 homes; however, it takes only five sump pumps operating at full capacity to overload an eight-inch sanitary sewer. How does the NFWB identify illegal connections? Whenever a property is sold the owners must call and arrange for a Water and Sewer Compliance Inspection. At this time a trained inspector will visit the property and complete a series of tests to determine that the water and sewer services are not in violation of any ordinances.